Reminders of the Obvious: What We Take for Granted - Veritas Communications Inc. 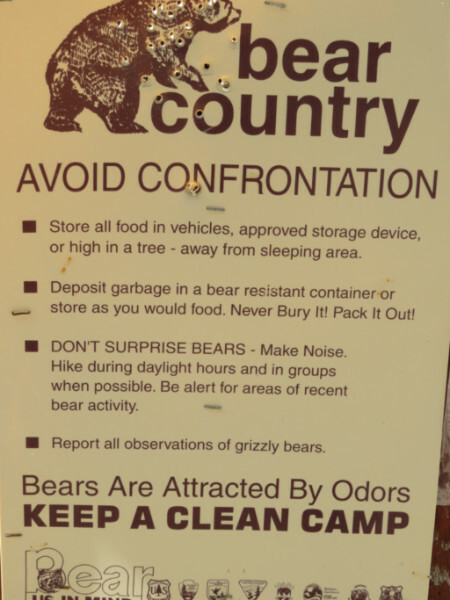 I stood alone at a trailhead and read the sign, “You are entering grizzly habitat.” What was I supposed to do? Carry a gun? Bear spray? Put bells on my shoes? Perhaps I have been foolish all the times I hiked in the mountains of Idaho and Montana and failed to recognize the risks involved? Another sign read, “Avoid confrontation.” Well, I thought, that’s exactly what I plan to do if I see a grizzly! I started taking photos of these warnings. When I came out from hiking five days in the Grand Canyon a sign read, “Getting to the bottom; OPTIONAL, Getting to the top MANDATORY.” I get this; Rangers have to rescue people out of the Canyon 400 times each year so maybe just posting one more sign will cut it to 300 rescues. On Mt. Whitney a gauntlet of signs awaits the eager hiker. One says, “The top is only halfway!” Yep, makes sense to me. At Kootenai Falls in Montana, it warns, “The river is very dangerous.” If you have traveled in Yellowstone you have seen, “Animals are dangerous.” I find that helpful to know. Why do we need signs to warn us about what is obvious? Is it because we are forever pushing the limits, believing that warnings are for stupid people, certainly not for us? As an author, you may have done dozens or even hundreds of interviews on a book, ministry, or project. At the risk of sounding like one of these signs, here are a few obvious things every interviewee ought to know, even if you have done hundreds of interviews. Be on time. A live interview at 3:00 pm means 3:00 pm, not 3:15. Be prepared. Have your book or materials in front of you and be ready to roll when the interviewer calls, or when you are scheduled to call the studio. Be upbeat. Bring energy to the process. Be engaging. Interact. Don’t answer “yes” or “no” and leave it there. Elaborate. Be aware of the clock. If you hear bumper music, begin to wrap up your answers. Know when the interview is supposed to end. Be flexible. Change happens. No one likes it but it is part of the experience. If a late-breaking news story preempts you, accept a reschedule with grace. Be grateful. Thank the host or producer for having you on. Be willing to call the station or program if you do not hear from them at your scheduled interview time. My wife even has a sign on the outside of her shed which says, “No Boys Allowed.” I ignore it because obviously, the sign can’t possibly apply to me . . .